If you need to wrap up the affairs of a loved one who has died, you may feel overwhelmed--especially when you're grieving. But you can do it, and this book will show you how. A roadmap to follow. 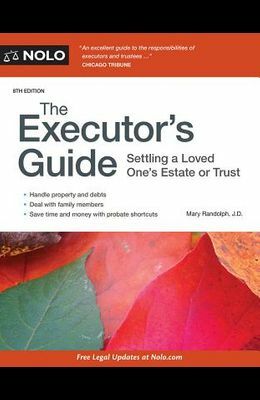 The Executor's Guide will lead you through an unfamiliar land of legal procedures and terminology. You'll learn what to do right away and what can wait. Find help on: preparing for the job of executor or trustee claiming life insurance, Social Security, and other benefits making sense of a will (and what to do if there is no will) how to determine whether probate is necessary filing taxes probate court proceedings dealing with family members handling simple trusts, and working with lawyers, appraisers, accountants, and other experts. The 8th edition contains updated tables outlining key points of each state's laws. Applies in all states except Louisiana.